I love you, my sweet Jack. I miss you so much. You'll always be my Jack. I'll always be your Mom. Jack left us today. 57 weeks to the day from his original diagnosis. 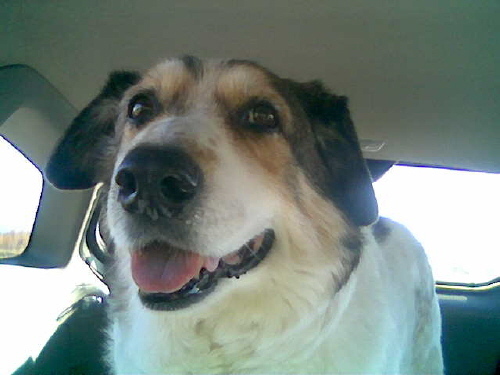 He gave us 10 years of love, loyalty, companionship, laughter and joy. Our house is strangely quiet, and we are completely overwhelmed with a sense of loss. We want to sincerely thank everyone who cared so much about Jack, and did so much to make his final months as 'normal' for him as possible. It appears Jack's time with us is drawing to a close. The lymph node on the left side of his neck is the size of a golf ball, we believe he's losing weight, and he's sleeping much deeper with a harder time to wake up and orient himself. However, he is still happy and anxious for his meals and last night was eager for a ride in the car after work. Although tired and not as "with us" as he used to be, he does not appear to be suffering. We're confident he's getting ready for his next journey and will let us know when it's time. Not quite yet... but probably soon. Please keep this wonderful boy in your prayers. One of our favorite commercials at the moment is for Raymond James Financial Services, about a woman who planned fastidiously for her retirement but somewhere along the line she went right on living and is still financially secure at the ripe old age of 187. That commercial reminds us of Jack. Diagnosed with two terminal illnesses and estimated to have reached a "normal" life span for a dog of his size... somewhere along the line he went right on living! He still isn't done yet. Last week Jack saw one of his favorite vets, Dr. Beebe, his integrative vet in Sacramento (to be honest, ALL of Jack's vets are his favorites!). She confirmed what Dr. Schneider suspected... Jack's lymphoma has returned. The lymph node Dr. Schneider said was enlarged was REALLY enlarged by last week and was unmistakable. We're not going to put him through the discomfort of a needle biopsy. If Dr. Schneider and Dr. Beebe agree that Jack is no longer in remission, that's good enough for us. So we celebrated a beautiful fall day and 55 weeks since the original diagnosis yesterday and took a ride into the Sierra to see the fall color and bark at select targets. He stuck his head out the window and really enjoyed the fresh mountain air. Jack tires easily but he still seems happy to be here and still looks forward to his meals. We don't think he's done being here yet. Jack has been with us for 10 years, and we're not sure how old he was when he arrived. He had survived in the northern Nevada desert for at least a week or more... fought of an attack of something (we think it was a coyote)... and was smart enough to chase down a coworker's vehicle for help. He was definitely a young adult, but probably at least 2 or 3 years old (a younger dog likely would not have survived the ordeal). That would make him at least 12 now. One of his vets here in Carson City said last month that she thinks he's 14 or 15 (she's always thought he was older and has never waivered in that belief). Last week. Dr. Beebe said she thinks he's 13 or 14. Although we might disagree about his exact age, we all agree that Jack has lived a good, long life! We just can't see putting him through any more tough or heroic treatments at his age. We try to put ourselves in Jack's "shoes" and think about what we would want at the twilight of life. We would want to be surrounded by loved ones, savor good food for as long as we can eat, take plenty of naps, and enjoy gentle physical touch with loving hugs. So that's what we are giving Jack. He has brought us joy, love, loyalty, companionship, and laughter over the years, and he deserves the best that we can give him for as long as he is here. Yesterday we celebrated 54 weeks since Jack's lymphoma diagnosis. With chemo, the median survival rate for dogs with lymphoma is 12 months, so that was our goal. Given his underlying heart disease and older age, we really didn't know if he'd reach that goal. He did and has even surpassed it! Every day is a joy just to have him with us. To mark his 1-year anniversary, we took Jack for a "node check-up" to Dr. Schneider. This time she noticed swelling in the left side of his neck. She thinks it might be enlargement of the lymph node, which would signal return of his lymphoma. However, all of the other lymph nodes were fine. That was about 10 days ago. We've been checking his lymph nodes at home (as best we can) and haven't noticed any further changes. His appetite is still good, his eyes are still bright, and he enjoys his rides in the car. If his lymphoma is returning, we would have expected to see enlargement in his other lymph nodes by now, so we're not sure what to make of it. He also saw his cardiologist, Dr. Hosking, soon after The Blessing. He hasn't seen her since last spring and we thought it might be worth a check-up in case she has any other tricks up her sleeve to support his heart. We agreed not to put him through any stressful tests (lying on an exam table is not a favorite activity for Jack), so she couldn't do a thorough evaluation. But, Dr. Hosking doesn't think he's in imminent danger of heart failure and saw no reason to add any more medications. That was good news! When Jack finished chemo last April, we made the decision that when/if he comes out of remission and lymphoma returns, we would not do chemo again. We're very glad we did it last year, but it was hard on all of us and if Jack could tell us, we're confident he would vote "no" on any subsequent chemotherapy. Honestly, he loves his vets but he's had enough of their needles and poking! He just wants to be comfortable and well fed for as long as possible. Plus, Dr. Rebhun (his oncologist) told us way back when that remission typically lasts only half as long the second time around. We only want to do what is best for Jack, and be his advocates for what we think he would want. And right now, he just wants a biscuit and a good nap. Today marks one year since Jack’s lymphoma diagnosis!!! Had we not done chemo, the vets gave him only 4 to 6 weeks. With chemo, we hoped for 10-12 months. Today is 12 months, and he’s still in remission! And… knock on wood… he’s acting like his old self. Appetite is terrific, he’s sleeping well at night, he’s happy to go for rides, he follows us around the house and yard, and he’s generally being the Jack we know and love. Our funny, sweet, and lovable guy. So to celebrate, he took us for a nice ½ mile walk at Lake Tahoe today, followed by a picnic lunch in the car, and a nice ride on a beautiful fall day. As we write this, he’s asleep and snoring on his futon. It’s the little things that make us so grateful to have him still with us. 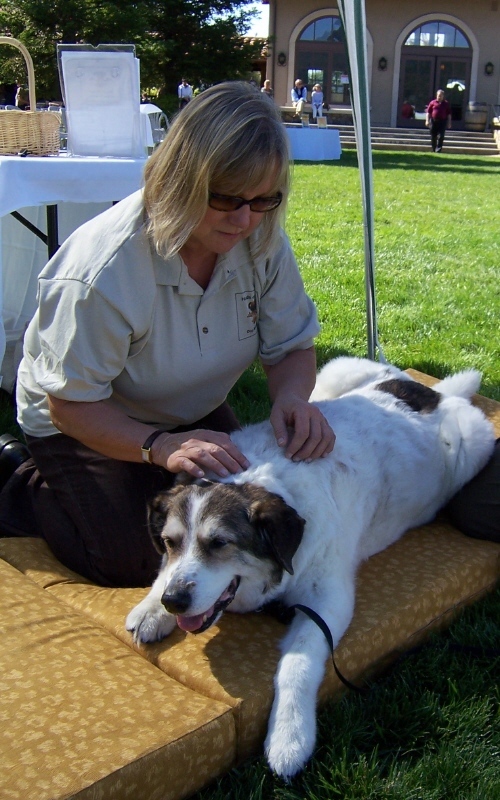 Several people have commented that they enjoyed the photo of Jack getting a massage from Heather at the Blessing last weekend. Here are a few more from that sequence. 51 weeks ago we took a weekend trip down to the Wine Country. We explored a little farther north than usual, and sampled several very fine wines from the Alexander Valley near Santa Rosa. On the way home, we stopped at St. Francis Winery (www.stfranciswine.com) to pick up a couple bottles of our favorite wine. 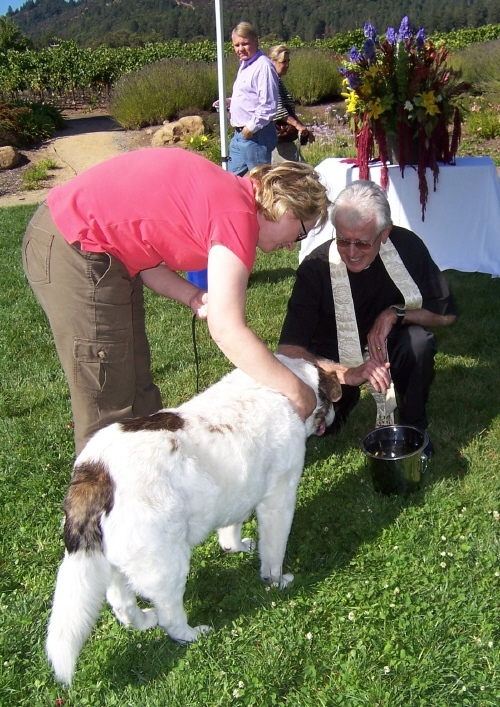 While there, we discovered a very special event – the annual Blessing of the Animals. Unfortunately, we were one week too late – the event had been the previous Sunday. When we got home that afternoon we learned that Jack’s lab results had come back positive for canine lymphoma. At that point we made up our minds that if Jack survived the year, we would take him back to St. Francis for the Blessing. For the last 12 months attending the Blessing has been our big goal. Through all the ups and downs of chemotherapy, we would rate our progress in terms of the likelihood that Jack would make it to the Blessing. Some weeks, we were convinced that he’d make it – other times we were equally convinced that he wouldn’t. As the weeks and months passed, the excitement started to build. Hotel reservations were made, and we all held our breath. He made it! It was an amazing experience. There were hundreds of people with hundreds of dogs of all shapes and sizes (the dogs and the people…). The winery special event staff did a fantastic job coordinating the whole thing, and everyone was on their best behavior (the dogs and the people…). 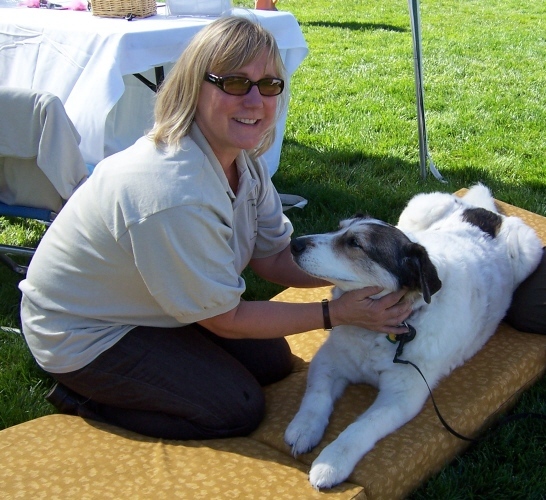 Jack had a wonderful time trying to meet as many dogs as he could, and he was especially fond of his new best friend in the whole world – Heather Greenham, certified Canine Massage Therapist. 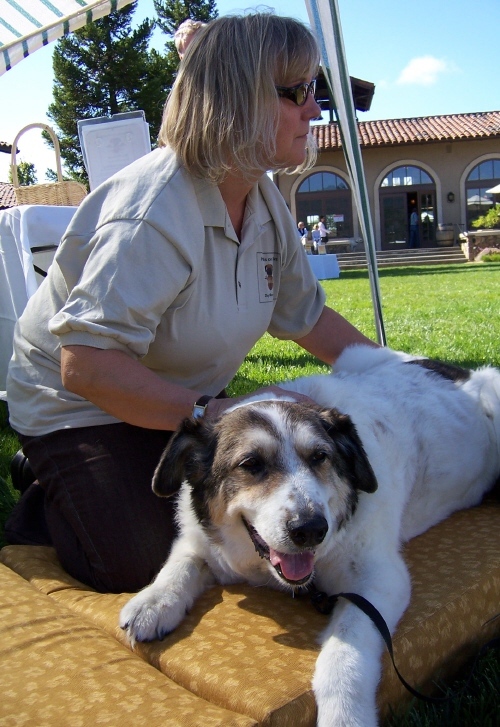 We want to extend a very special thank you to Father Leslie for his patience and sincere love of animals, and Mary Pryor, St. Francis Winery Hospitality Guru for her gracious kindness in making us feel so welcome. Please check out Jack’s Blessing Page for more photos.